Have you ever worn something that was so uncomfortable you couldn’t wait to go home and change into those sweatpants you only wear around the house? “Go big or go home,” is a saying that certainly holds true when it comes to some fashion items. Don’t let a larger size scare you. 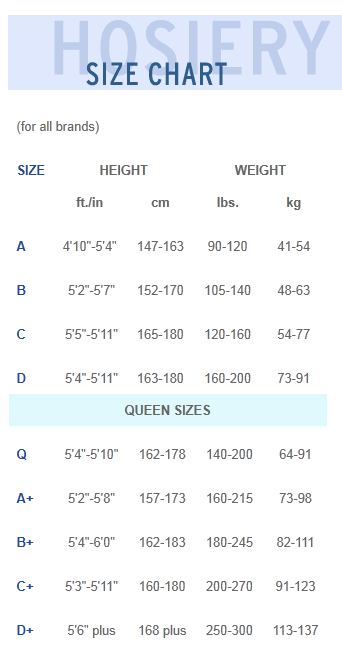 Your height and the quality of the garment often play a major role in choosing your right size. Lets face it, when you feel comfortable, you look more confident, and hey, you can stay out all night rather then running home to put those fat girl sweats on! Stockings: If you are tall it is always best to buy the next size up in tights and stockings. For the best fit and comfort, you want the band to hit your waist, not on your hip which could give you a muffin top…not cute. Same might go for leggings depending on the quality and brand. Leather jackets: Leather can be tricky, especially if you are ordering online. If a jacket is intended to be worn for warmth throughout the winter, slip on a sweater or heavy undergarment, take your measurements, and then order the jacket accordingly. Obviously, it is best to try the jacket on in the store to guarantee you like the fit and quality of the leather before making the splurge. Sweatshirts: Simple comfort, that’s the point of sweatshirts! I typically don’t wear sweatshirts unless I am around the house or making a quick run to Whole Foods, but when I do, its usually not my “cutest” look. If you still want to look chic while keeping comfortable, wear your skinny jeans for a well balanced look. Cotton shirts: Cotton is always comfortable, but unfortunately 100% cotton usually shrinks a size after putting it into the dryer. It’s always better to buy a size up rather than your actual size. This will ensure the shirt’s longevity. U.K Designers: Don’t freak out when you shop at stores like Topshop, H&M, or ASOS and can’t fit into your usual size. Before racing to the gym, keep in mind that U.K. sizes tend to run smaller by one or two full sizes than U.S. garments! To make sure the garment fits properly and isn’t too short-waisted or tight, I have found that it is best to try on the clothing in these stores before I make a purchase. ALWAYS buy these items in your size: Rings, bangles, bracelets, lingerie, and shoes. You will most likely never grow out of these items. Trendy Transportation Around New York City!